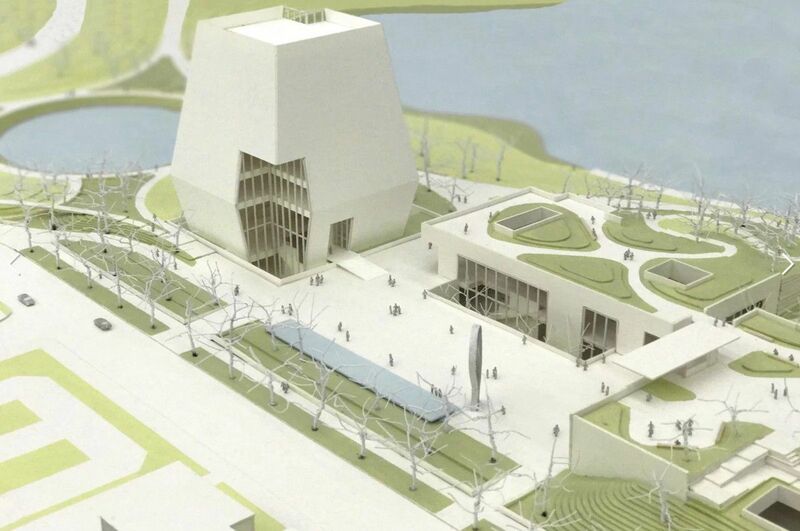 Designs for the Obama Presidential Center in Chicago were unveiled Wednesday, showing a complex housing a museum, a library, classrooms and a forum for public events. “More than a library or museum, it will be a living, working center for citizenship,” former President Barack Obama said in a video released by his foundation. The stone and glass structures shown in the images would cover around 200,000 square feet in historic Jackson Park, and have rooftop terraces with views of Lake Michigan, according to the Chicago Sun-Times. The architects working on the project are husband-and-wife team Todd Williams and Billie Tsien. The current plan for the grounds would reroute traffic on one nearby street, DNAInfo reports. The Museum, the tallest of the three buildings, will hold exhibition space, public spaces, offices, and education and meeting rooms. The Forum and Library buildings will be community resources for study and Foundation programming. The Foundation is currently exploring the possibility of locating a Chicago Public Library branch on the site, but as always will continue to solicit input from the community as to how the Library building can best be used to meet community needs. The Obama center’s location has not been without controversy. Last year, Charles Birnbaum, CEO of the Cultural Landscape Foundation, wrote an op-ed for Next City that criticized the foundation’s choice of Jackson Park. He wrote that because parts of Chicago are relatively park-poor, the foundation should have chosen a site next to the historic park, rather than taking it over. Residents and officials have also voiced concerns about how involved the surrounding community will be in the construction process. The Sun-Times reports that at today’s unveiling, the Obamas also announced they would give $2 million to fund a Chicago summer jobs program.